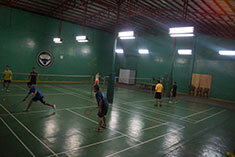 Badminton is a sport that is popular with a great number of Nomad's members, especially the ever-growing number of Filipinos. So much so, that a second court will be added in the near future. Although all members can enjoy badminton virtually at any time, Monday evenings, from 7:00 p.m. the court is reserved for the Badminton Section. This doesn't mean that people who have not formally joined the section cannot play. What it means is that the section will organize the actual games, usually doubles to ensure everybody can get as much playing time as possible. This is an ideal time for the new member who loves the game to meet with other members who have the same interest. The Badminton Section organizes a competition each year and also has the opportunity of playing military personal from visiting naval ships.